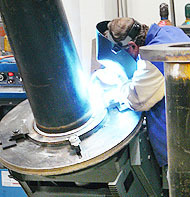 Enertech, a product and service brand of Curtiss-Wright Nuclear, provides precision machining and ASME welding services for repairs of critical parts and components, fabrication and assembly of modules and skid packages. Customers rely on Enertech for engineering expertise and innovative design, manufacturing and high quality custom components and system integration. 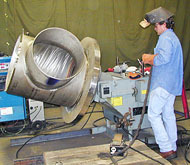 Our machining and fabrication solutions can meet tight delivery schedules within a competitive cost structure. This combination of application expertise, industry knowledge and skilled technicians, make Enertech a key solutions provider to the nuclear power industry. Enertech employs an array of inspection tools and commercial dedication processes to insure conformance to drawings and specifications. QA inspectors apply hands on experience using touch probe and optical based measuring tools to verify dimensions and identify out of tolerance conditions. 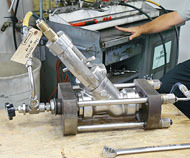 Build to print or initial concept, Enertech provides superior design, engineering and fabrication capabilities based on decades of experience integrating vessels, pumps, valves and heat exchangers for critical applications. Enertech's shop is managed for performance to deliver projects of the highest quality standards that meet our customer's toughest challenges and stringent business needs and schedules. Enertech provides precision CNC machining based on state-of-the-art CAD/CAM programming to save time and reduce waste thereby minimizing cost. 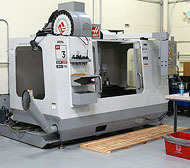 Multiple vertical and horizontal CNC machines centers along with manual lathes, drills, grinders and boring tools create complex specialty parts and components. A fully equipped ASME Section IX weld shop with experienced welders perform gas tungsten(GTAW), shielded metal arc (SMAW) and flux core arc (FCAW) welding processes using manual and semi-automatic methods. 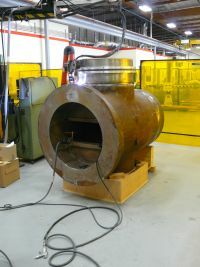 Equipment includes wire feeders, manipulators, backing gases and various fixtures to support difficult workloads. In house documented procedures and qualifications supported by NDT technicians excel at meeting the most challenging customer requirements.